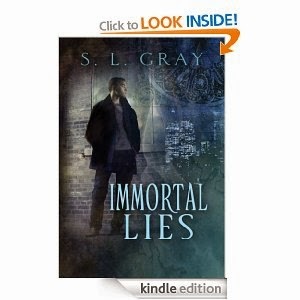 The next review on Fantasy Muse is an urban fantasy novel called Immortal Lies (Tybalt Jones) by S.L.Gray. "Being a vampire isn't all it's cracked up to be. Anyone who tells you otherwise is prowling for a snack. Tybalt Jones is not your typical creature of the night. He prefers Havana shirts to capes and his "sidekick" is a curvy faerie girl. Not a hunchback in sight. He's been out of the vampire "scene" for years, and he'd be happy to stay out for the rest of his unlife. But vampires connected to Tybalt are disappearing from St. Sebastian's streets. To make matters worse, he's on a literal deadline to clean up the city. With a little gypsy know-how, a dab of faerie luck and a crash course in using his unusual gifts, he might just survive to restore peace. I'm normally quite particular when it comes to urban fantasy novels, but the fact that it was a female author writting from a male's perspective caught my attention. Normally - at the chance of sounding prejudiced - when female authors write a paranormal type book, it always invariably involves a girl who has to fend off the interest of two studly supernatural men, while batting her eyelashes and deciding which one to pick. And I appreciate it that she didn't take the easy option. The story follows Tybalt Jones, a vampire with a 'hero complex', who finds himself pushed into investigating a bizarre case of vampires suddenly disappearing. The common connection being that they're all linked to him. Along the way he finds out that the man responsible for the spate of kidnappings has a serious grudge against him. Tybalt is not alone in his endeavours and has help from his fae girlfriend, Violet, an old witch and her geeky nephew. My initial thought from just reading the first chapter was that this was a well written book. And so it proved throughout. The writing flowed smoothly, and never felt stilted or hesitant. The sentences were purposeful, clever and witty. I did come across the odd typo, for e.g corner instead of coroner - I think it might have been a case of predictive text altering the meaning. My one tip for the author would be to have a quick read over, because, although they didn't obstruct the story in any way, they were easy to spot and mend. What I did like about this book was that despite it being the first instalment, the author didn't try and dump a whole lot of info on you. Instead it was given in small measurable doses. I don't know about you but I get tired of reading a biography every-time a new person is introduced or when scenes are described right down to the last brick and mortar. Tybalt's being chased by a mysterious man, but we're not given any clue as to why that is until after the half way stage. I get that the author wants to stretch out the mystery, but it would have been nice to have some inkling into what Tybalt did to p*** him off so much. I liked the fact that Tybalt and Violet were already in a committed relationship before the start of the book. It's nice sometimes to skip all the melodrama of courting. The cast of characters in the book were all interesting in some way. But I wasn't overtly fond of Tybalt, as he was a little too clean cut for me. Personally, I prefer my main hero to have more of an edge. There wasn't as much action as I would have liked. Not to say there wasn't any at all, but the majority of those scenes arrived near the end. This is a well written book, that wouldn't look out of place in a bookstore. The author has a talent at composing sharp, clever sentences. And while this wasn't my favourite urban fantasy novel; it certainly wasn't the worst. I'll be keeping an eye out for any sequel's.